Roof Insurance Claims In Dallas, TX For Storm Damage And More! In addition to the repair, maintenance, installation and replacement roofing services we offer, Eclat Roofing boasts yet another specialty: Dallas, TX roof insurance claims. With the help of trained insurance specialists, we will help get you the money you need to fix your roof after substantial damage from a storm. We want to help get your roof back in good working condition to secure your home or business against the elements. If your roof has experienced severe storm damage that you believe your insurance company should cover, call us now at (214) 373-1500. Our insurance specialists can walk you through filing your insurance claim from beginning to end and help you get the most out of your insurance company from your roof damage. Then, we can provide you with the necessary repairs or replacements at an affordable price. The first step is calling your insurance company. File your insurance claim. After that, a claim adjuster from your company will follow up with you — it is important that you get their contact information, including any alternate phone numbers where they can be reached. Tell the adjuster you would like them to get in touch with your roofer as soon as possible. Call us with the adjuster’s contact information. 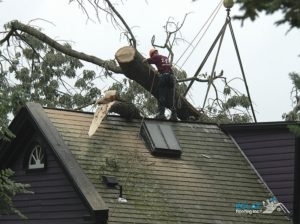 We will set up a time with the adjuster to take a look at your roof. Not only will doing this save you time, it will also make sure that both an experienced roofer and an insurance agent have taken a full look at your roof and examined any damage to it. Once we and your insurance provider have taken a look at the roof, they are allowed 36 days to deliberate and let you know if your claim is approved or denied. They may ask for an extension during this time, and your insurance company cannot wait more than 45 days after giving you an additional notice. For any storm-related damages, as outlined by Texas Law, the company can take no more than 45 days to deliberate. This means that all-in-all, the longest amount of time they can legally take is 81 days. The insurance provider has to pay the claim within 5 days if it is approved. If it’s weather-related, this can stretch to 15 days. If your claim is rejected, the company is required to tell you why in writing. You reserve the right to have the repair or replacement done by the company of your choice, and Eclat Roofing would be happy to be that company. We have over 15 years of experience in commercial and residential roofing, which makes us a trustworthy pick. But don’t just take our word for it. Call us at (214) 373-1500 for references from previous projects! We are the best choice for Dallas, TX roof insurance claims. Don’t hesitate to contact us for any roofing services in DFW! Updated on September 13, 2018 at 3:09 pm by Eclat Roofing.